When Marilyn Hornsby leaves her job as a telephone sales representative for a medical supplies company in Melville, she has no desire to exercise. But Hornsby, 62, of East Meadow, has found a way to fit exercise into her busy day. She eats at her desk and spends most or all of her hour-long lunch break walking nearby. “The walk is very good for me,” she said. “I sit all day at my desk and need this exercise.” She said her doctor recommends walking for her bad back. Many Americans say they don’t have time to exercise, but research shows that even short bursts of physical activity help. Any period of exercise counts toward the U.S. Department of Health and Human Services’ physical activity recommendations that adults do at least 150 minutes a week of moderate-intensity aerobic physical activity, or 75 minutes of vigorous activity. Moderate activity includes “anything that gets your heart beating faster,” the guidelines say. Previously, the U.S. Department of Health and Human Services’ guidelines said exercise should be in sessions of at least 10 minutes. Revised guidelines released in November eliminated that requirement. There are many ways to squeeze a few minutes of exercise here and there into the workday or into time after work or school, said Catherine Tuppo, program coordinator at Stony Brook Medicine’s Bariatric and Metabolic Weight Loss Center in Centereach. For example, if you drive to work, park your car farther away than you usually do, she said. “Then act like you’re late for work and you have to get to the door to work quickly,” Tuppo said. That’s because walking briskly is more beneficial than walking slowly. As the weather gets warmer, many people have more motivation to exercise, said Adam Gonzalez, an assistant professor of health professions at Hofstra University and an expert in exercise physiology. When Hornsby was walking with a workmate on a recent 50-degree early afternoon, there were only a few others walking down a 1,500-foot section of Duryea Road in Melville that is popular with workers from nearby office buildings because it dead-ends and has no intersections. 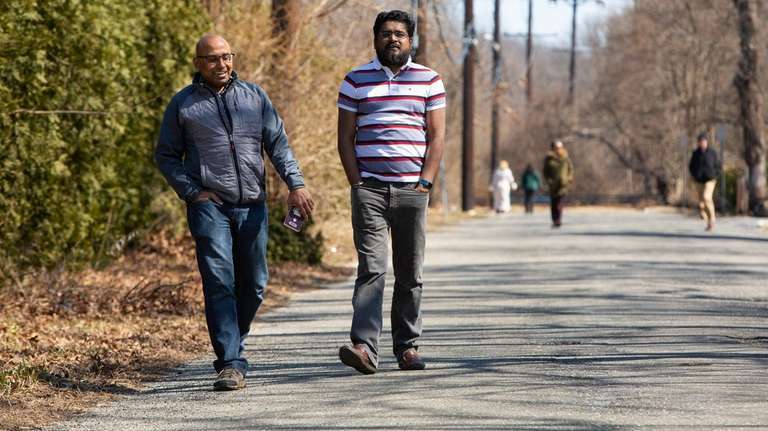 “If it’s a nice spring day, 70 degrees, you’ll see a lot more people out,” said Hornsby’s walking partner, Jim Lopes, 45, of West Babylon. Michael Walsh, 68, of Islandia, was on a 20-minute walk on Duryea just before Hornsby and Lopes arrived. Weight loss and control is one of many benefits of exercise, Gonzalez said. Physical activity also reduces anxiety and depression, can lead to better sleep, can improve cognition and prevents disease, he said. Nearly $117 billion in annual health-care costs and 10 percent of premature deaths are attributed to insufficient physical activity, according to the U.S. Department of Health and Human Services. The key is to find an exercise regimen that is realistic, Gonzalez said. “The biggest predictor of success with exercise is adherence, if you stick to the program,” he said. That’s one reason bursts of exercise throughout the day may be a good option for some. Three minutes of walking six times a day adds up to 18 minutes a day, he said. Fitness classes, which sometime last only 30 or 45 minutes, are another option, because exercising with a group “holds people accountable,” he said. Most Americans need more motivation to get off their chairs and sofas. A June 2018 report from the U.S. Centers for Disease Control and Prevention found that only 22.9 percent of Americans — and 18.9 percent of New Yorkers — aged 18-64 get the federally recommended amount of exercise, which, in addition to the minimum 150 minutes of weekly moderate aerobic exercise, includes at least two days a week of muscle-strengthening activities. Perceived time constraints are a big reason for that, said Dr. Genna Hymowitz, director of bariatric psychology at the Stony Brook weight loss center. “It is the hope that by understanding the new research that suggests that any amount of activity is better than not being active, that more individuals will start to move a little bit more,” she said. No time to go to the gym? Experts have suggestions for fitting in exercise throughout your work and home life. Park farther away from work and walk the extra distance. Take multiple short walks during the work day. Use a hand mower to mow the lawn. Garden and vacuum at a more vigorous pace. Walk to talk with a co-worker in person rather than use the phone or email. Take the long way to get to the restroom.